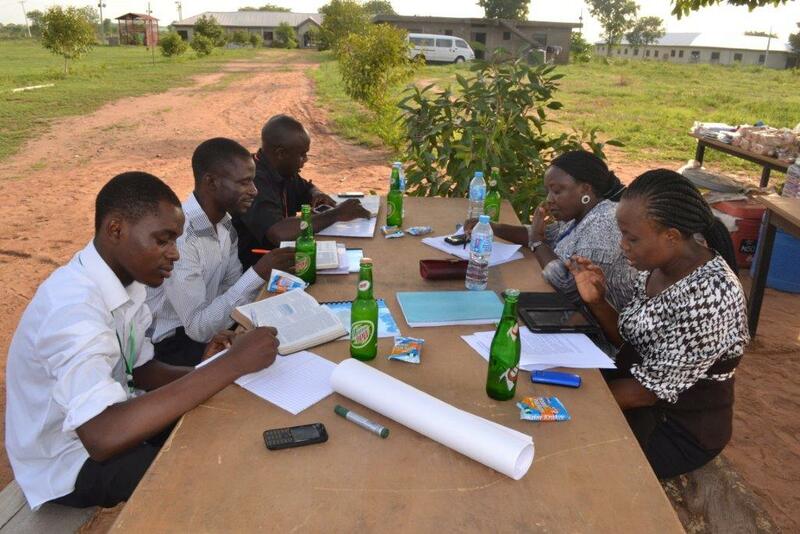 We are grateful to God for awakening our interest in his Word through IFES consultations on Scripture engagement. Now our desire is to pass on this interest to others in El Salvador. We have been doing so in different ways. Over the past two years, we have been teaching a session on Scripture Engagement at our national training event for students. Each time, I (Cinthya) teach this session, I fall deeper in love with the Word. Repeatedly, I am amazed at what God is doing in the lives of students through his Word. And have come to realize just how important Scripture is for the Christian life. During these past months, we also had the privilege of teaching young people from different churches about Scripture engagement. It was a joy to see their perspective on God’s Word change completely. One of the results is that they have become interested in the work of MUC at university. These sessions have opened a door for us to collaborate with young people from different churches. The topic which sparks the most interest is reflecting on what it means to love, study, live and share the Word. We encourage young people to foster a real love for God and his Word. Studying, living and sharing the Word flow out of this love. In an attempt to grow in how we address the challenges of our world biblically, one activity has been very enriching. We start by reading the reality of the country we live in. We ask the participants to create a collage from newspapers with the challenges, desires and fears of their fellow students. Then we ask them to find answers to these issues in the Bible. Many reply with individual Bible verses that give a superficial answer. We question these answers so that they realize how important it is to have a deeper biblical knowledge than just a few memorized verses that are known by almost the entire population of El Salvador. We finish this exercise with a small study on Habakkuk and how God’s answer to this prophet might relate to questions in our context. Our purpose is to see how we can hold the newspaper in one hand and the Bible in the other. We have been able to touch the lives of over 150 students from MUC and over 50 young people from churches with sessions on Scripture engagement. God has been good and we have seen some young people commit to studying and loving God’s Word. Our church in El Salvador needs to abandon religiousness and have its love for Scripture rekindled. This was the theme of a very memorable Scripture engagement consultation for which over 100 NIFES student leaders, staff and associates gathered in Abuja, the capital of Nigeria. Our time together started with a pre-consultation to train the small group facilitators on how to lead their groups. This was important since work in small groups played a significant role during the consultation. One of the high points of this consultation was a small group project, in which we worked together on the way in which God’s Word connects to the realities of our context. One aim of this exercise was to renew the good practice of coming back to the Scriptures when dealing with the challenges of our context thereby strengthening our conviction that Scripture is relevant to all of life. Each small group worked on one contextual issue in four steps. First, we identified the main challenges about this issue: what provokes us to seek a Christian response? Secondly, we brainstormed biblical passages which could help address this issue. Thirdly, we chose one biblical passage to look at in more detail and see how it speaks to the contextual issue. Lastly, we thought about creative approaches/relevant ways of sharing this passage and its perspective in our context. Each group presented their work on a cardboard paper and displayed it for the other participants to go through. This was really educating! Personally, working on the small group project was very transforming. Going through the Scriptures to see what God’s Word says about every form of malpractice and corruption was not only hard work but also engaging. The big question became: How will we as a national movement address the issue of examination malpractice/academic corruption in our country? When I now hear of Scripture engagement, I do not only think of studying my Bible, but of much more. I think of LSLS: I think of Loving, Studying, Living and Sharing God’s Word. For me, Scripture engagement has shifted from being a mere activity to a lifestyle. I have resolved to live out the Word of God and to share it with my friends and siblings. My conviction about Scripture has deepened and I desire the fruitful change which God’s Word brings. Jesus the host, who invites us to his Word, is the reality that changes everything. When speaking evangelistically in a university context, I want to deal with issues that are relevant to students while also showing that the Bible speaks relevantly into these issues. Questionnaires helped identify some themes which connect with students, e.g. identity, achievement and self-esteem, relationships, meaning of life, death. I start my talks with the deeper questions which lie behind the theme: How do we build identity and self-esteem? What does it mean to live in a society which builds identity on achievement: I achieve, therefore I am? What does this do to our society, to our relationships, to our self? So I raise questions, give an analysis, and look at the answers given to us by current trends in our society. Then I relate the issue to a passage from Scripture explaining how God comes into the picture and why together we will look at a biblical text. I am convinced that the Holy Spirit wants to make the words of the Bible come alive in people’s hearts. I achieve, therefore I am. What would be a good gospel passage to help people understand that God is different and treats us differently from our society? In Matthew 20:1-16, Jesus tells a story that reveals the character of God. It comes as quite a surprise, if not as a shock: He treats us according to his goodness and not according to our achievements. But his goodness also reveals our evil heart: Are you envious because I am generous? Relationships (just being used by others; healing and forgiveness); Luke 7:36-50. Die happy: Let us eat and drink because tomorrow we are dead: Luke 12:16-19. Religion (contrasted with the reality of Jesus): Philippians 2:5-11. Encountering Jesus in these stories has led many students to read one of the gospels by themselves. In this way, God’s Word itself becomes the evangelist. Africa is plagued by corruption and Ghana is no exception. No matter where you go it seems someone is expecting a pay-off, a favour, or ‘a little something’ just to do what they are paid to do. This problem is a hindrance to national development and a major blight on the character of a nation where more than 60% of the population claim to be Christian. But what is the source of this corruption? Where there is fruit, we must examine the root, and one place where seeds of corrupt practices are sown is in the examination halls. Cheating, in one form or another, has become endemic on our campuses. Students from the IFES movement in Ghana (GHAFES) are however taking a stand. Last year, GHAFES students at the University of Cape Coast decided to launch the project C.A.M.E. – Campaign Against Malpractice in Examination. This campaign focuses on Christian students, many of whom have bought into the growing culture of cheating while adopting an ‘everyone is doing it’ attitude to the issue. Its aim is to remind these students that cheating in examinations is a sin and challenge them to refrain from doing it, thus setting an example on the campus at large and raising the standard for integrity. GHAFES students are using a variety of innovative and creative approaches to raise the issue on campus. These include a banner (see image), flyers, stickers and posters. 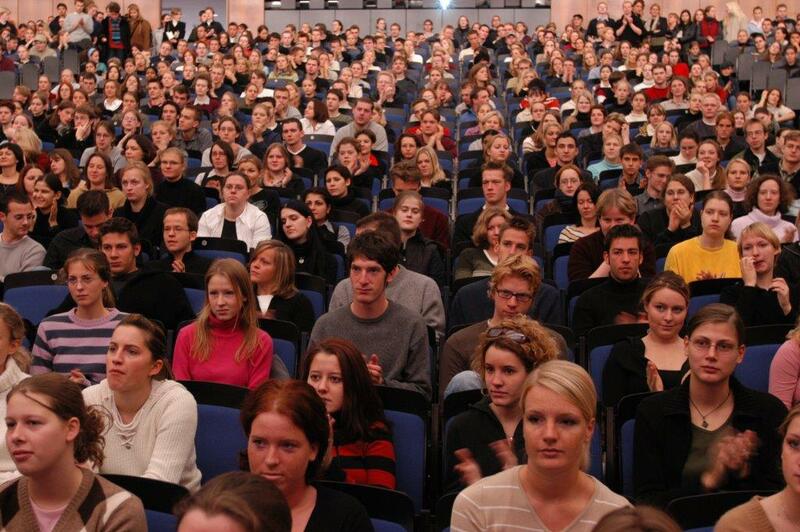 A video documentary was broadcast in six different halls on campus to expose and highlight the issue. The campaign also included four interactive hall forums where these hidden deeds could be brought to light and steps taken to address them. Some students reacted negatively to the campaign and asked GHAFES to stop it, believing it to be a hindrance to their progress on campus. Nonetheless, GHAFES students are continuing their efforts, trusting that “Better is the poor who walks in integrity than a rich man who walks in crooked ways” (Proverbs 28:6). What have been the results? We praise God for these students who are taking the initiative to change their campus and pray for their ongoing efforts to bear fruit – not just on the campus, but throughout Ghanaian society. Whenever I now approach Scripture, I’m amazed at how much it has to say about justice. 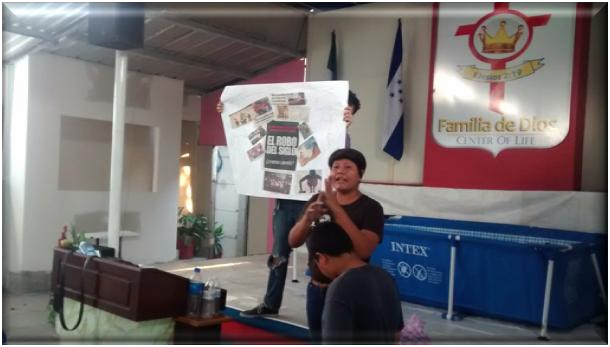 This awareness grew in me through our preparations for last year’s “Arts Festival for Justice.” As a local student group of GEU (the IFES movement in Guatemala), we organized this festival as a public one-day event at our university. We invited the student body to come and express their view of justice through the arts (literature, drama, music, photography, etc. ), while ourselves preparing artistic presentations from a Christian worldview. God led us in a learning process as we prepared for the festival. Corruption and injustice are the daily bread in our country. Some time ago, we invited students to ask God a question. Many responses were related to justice issues, e.g. ‘Doesn’t the lack of justice in our context speak of an indifferent or non-existent God?’ We were shocked to realize that even in the light of such a reality, we had a very shallow idea of biblical justice. We plunged into the Word of God and in a very exciting journey found transforming truths and more hard questions. We found a just God, tremendously interested in justice. We found the whole human race and ourselves guilty, unjust, inclined to do wrong. We found hope for humanity in a unique sacrifice that justifies, redeems, restores and transforms us from serving injustice to becoming bearers of justice in our time today – whilst hoping for the day when justice will be complete. As a part of our preparation, we also visited some of the injustices in our city. One image has stayed with me, from a visit to the Guatemala City dump: a single mother living with nine children in a four square meter house; scavengers searching in the trash for food or something they could sell. And in the midst of it, us having a Bible study on how God sees Hagar and has mercy on the downtrodden. The insights we gained through Scripture inspired us to create a number of artistic presentations for the festival. 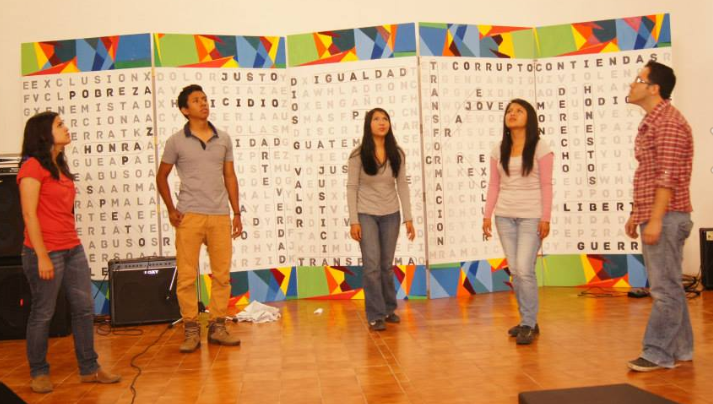 One of these was a play based on Romans and the theme of justice which some staff from COMPA Mexico wrote and helped us prepare. Around 650 students came to the festival and more than 100 students contributed with artistic presentations. We are so thankful that the university gathered enthusiastically around a theme on which the Bible has so much to say. Art was a great vehicle to communicate biblical truths and address questions about God, us, and the world. 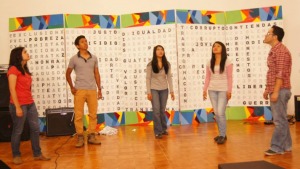 We praise God, for his Word brings true life and hope to our lives, to the university, to our societies.